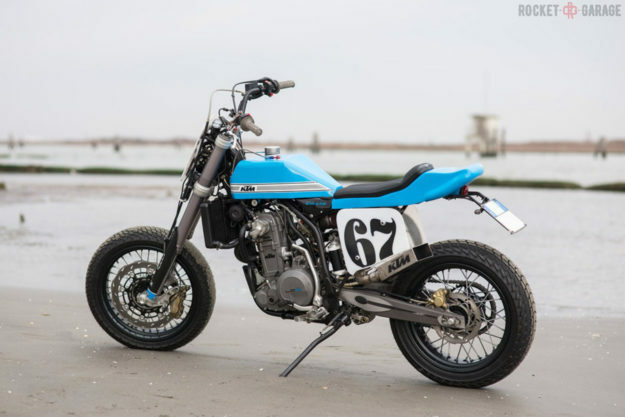 Yamaha WR450F 2-Trac by Deus If a privateer’s former Dakar racer found its way into your garage, would you leave it be? Or break out the spanners? How about if said moto was a rare Yamaha WR450F 2-Trac? Well, at Deus Milan they got out the spanners and grinders and started beating on sheets of aluminum. 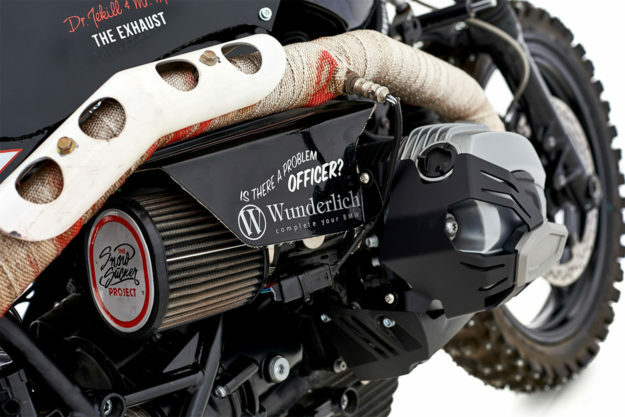 With the Yammie stripped down to its barest essentials, the Deus team set about creating a brand new look for the formidable off-roader. New plastics were formed using ballistic-grade polymers for the mudguards at both ends. The rims were anodized in gold, matching the signature shade of the hydraulic Öhlins 2WD system, and the chunky rubber has been foam-filled. The engine has been blasted cleaner than the inside of a hand sanitizer bottle, and the suspension has been tweaked at both ends. 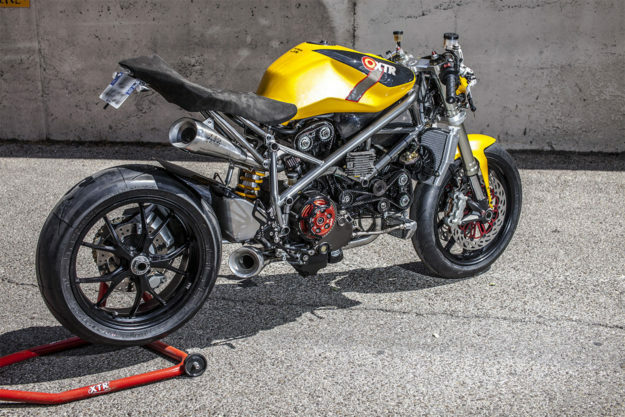 Ducati 848 by XTR Pepo If speed, performance and aggression light your wick, this latest creation from Pepo Rosell is absolute fire. 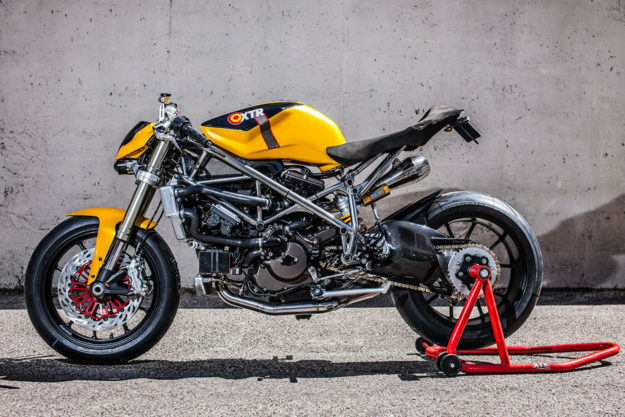 Dubbed ‘Doud Maquina’ this Ducati could be the custom that brings the streetfighter movement back to early 2000s levels of cool. As with most of the builds rolling out of the XTR garage, Pepo has left no nut or bolt unturned. 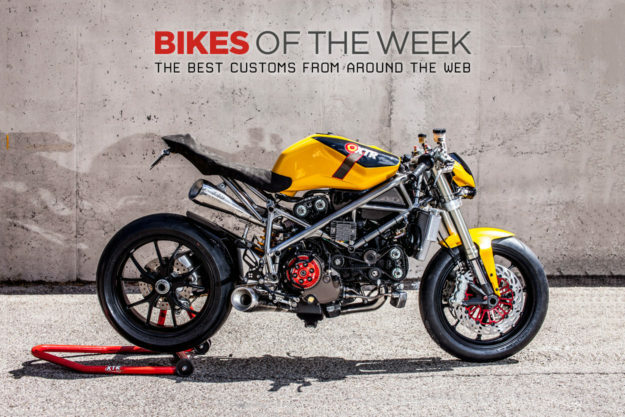 Starting with a complete teardown of the donor Ducati, the engine has had its heads ported, and a new set of machined air intakes were crafted—as well as a custom carbon fiber air box. The stock ECU has been swapped for a programmable EVT unit, and the 848 now mixes air and fuel via a 1098 throttle body. As always, there’s a custom Super Mario exhaust system bolted up too. And yes, your eyes aren’t playing any tricks, that is indeed a dry clutch set-up, courtesy of EVR. KTM 640 LC4 by Just Bike With the American flat track season about to start in Daytona, the hunger for slideways action is on the rise. And that excitement isn’t isolated to the ole U.S of A. 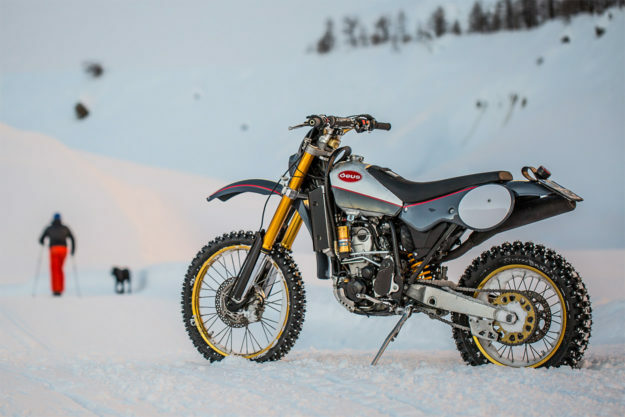 Case in point: this gorgeous KTM conversion from Just Bike of Marcon, Italy. Starting with a SuMo in their shop, it was quickly put on a diet. 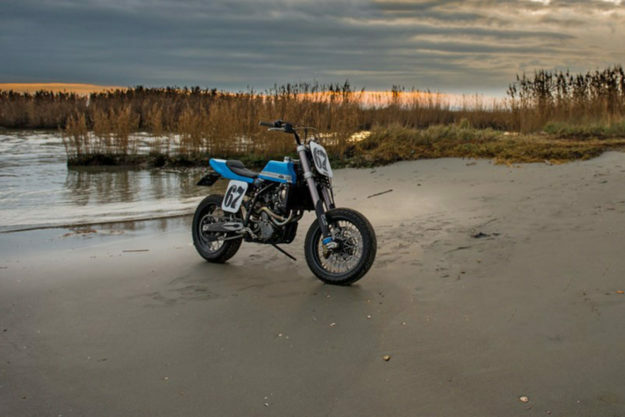 The stock subframe and enduro-vibe plastics hit the skids, and an all-new seat and tail were dreamt up. When the resins cooled, the neatly angled tail you see here was the result. But Sliding Blue isn’t just a track machine. You’ll no doubt spot the single disc up front and notice that the seat by Cisco Leather of Venice is filled with enough padding to do more than serve as a thigh rest on a 45. The tank is also brand new and bespoke, thanks to some crafty work with stainless steel and a TIG welder. Vintage Electric ‘Jeff Clark Signature Cruz’ Are you tired of walking out of your Malibu home, surfboard under arm, waiting to feel the sand grinding between your feet and your Vans? Well sir, you need suffer no longer. 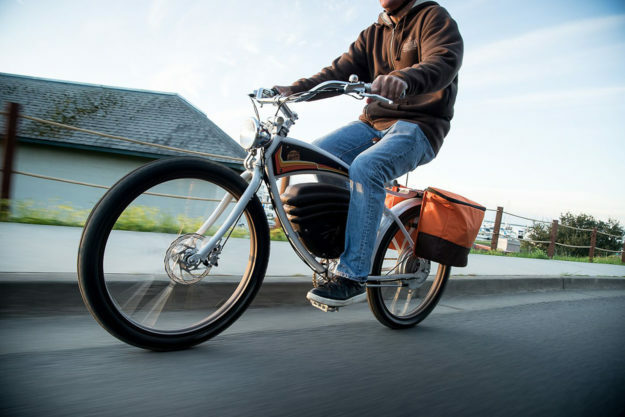 Because California-based Vintage Electric Bikes has recently pulled the wraps off the Signature Cruz. 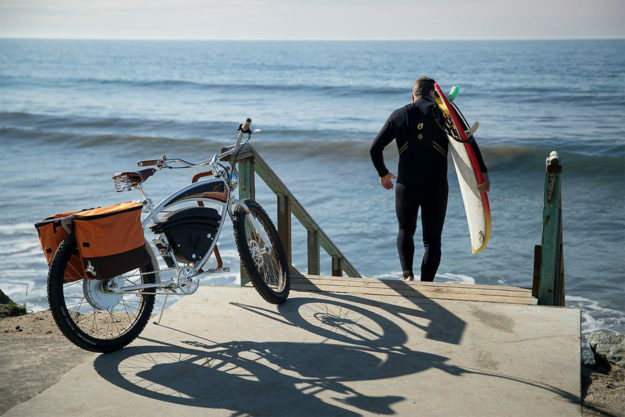 Kidding aside, there’s a delectable modern contemporary vibe to Vintage Electric’s e-bikes, and this one is arguably their coolest. Powered by a 702-Watt hour lithium battery, there’s enough juice to hit 36 mph (58 kph) in ‘race’ mode—or you can cruise from break to break for upwards of 35 miles (56 km). The 3000W direct drive motor is stationed in the rear hub when you need it, or you can opt for pedaling in a pinch. Shimano hydraulic discs slow things down, and springs under the seat offer ride compliance. Most importantly, charging takes just enough time to squeeze in a sit-down with Point Break. Just kidding. 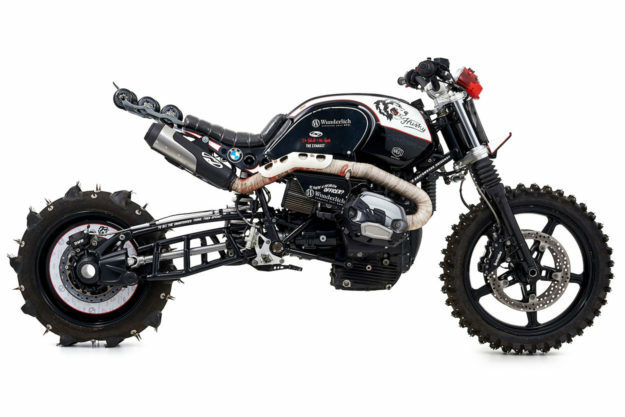 The project was actually devised to compete in the ‘Harley and Snow’ hill climb event in Tyrol, so Nagel took an R nineT Scrambler and beefed up its off-piste bonafides. Being a hill climber, the obvious first step was to stretch the wheelbase to keep the boxer planted. 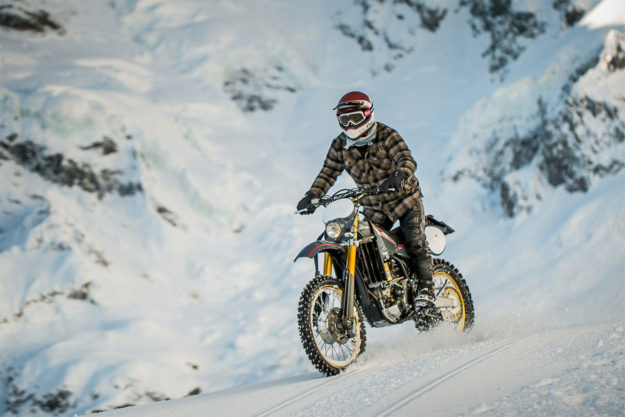 The new rear swingarm is, well, totally tubular. 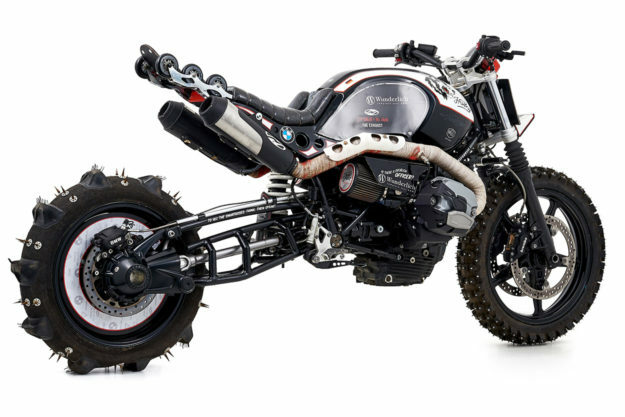 The cagey design is also lighter and stronger than a cast unit, and allowed the team to maintain the Beemer’s shaft drive—although that’s been tweaked a bit, too. A gargantuan sand paddler tire, complete with ice spikes, was fitted up after that. Nic was working in conjunction with Wunderlich, the BMW bolt-on specialist, and many of the components can be sourced from their catalog. But some things can’t be bought off the shelf—like the custom Dr. Jekill & Mr. Hyde exhaust system. Or what appears to be bits from a pair of K2 rollerblades grafted onto the rear subframe.